This post is a follow-up to my Review of 2014 post. Here I talk a little about plans for the coming year. I currently have a list of over 20 ideas for Kickstarter projects. Many of them are for mapping pads to extend the Squarehex range. However, there are a few other projects I'd like to try. Whilst I hope to run lots of future projects to extend the Squarehex range of pads and notebooks, in the coming year I also want to try a couple of different things. A Kickstarter project typically takes 2-3 months (funding/transfer of funds/production/fulfilment) so in 2015 I expect to be able to get through 4 or 5 new projects. The current A5 Gaming Notebook project will be fulfilled in February. The next Kickstarter project after that will be to print a new A3 pad called the Dungeon Desk Pad. I'll announce it here and email previous backers/customers as soon as it launches. In 2015 I plan to attend all the shows that I did in 2014. There's a chance that I'll slot one or two more in, and I'm going to look at Conception and Salute for 2016. I want to gradually improve the website. Top priority will be to get some better images of all the Squarehex products. Paper is surprisingly difficult to photograph but I think it will make a big difference if I get it right. I've got mixed feeling about selling products other than my own on the site but they help keep the site in profit so they can stay for the time being. At the moment none of my products are distributed by third parties. I'm not including print-on-demand (Lulu) or PDFs (RPGNow) in that and they will continue as they are. In the next year I plan to tentatively offer a range of products to a small number of UK retailers on a trial basis. I already list several Squarehex pads on eBay and have found it to a great way to reach new customers. I also already sell games and RPG books on Amazon, and this year I will add the Squarehex range as new product listings on Amazon. So that's the plan, or as much of it as I can share for the moment. I'll write another review at the end of the year to show what actually happened. The Squarehex sale starts today and will run until Thursday 15th January. 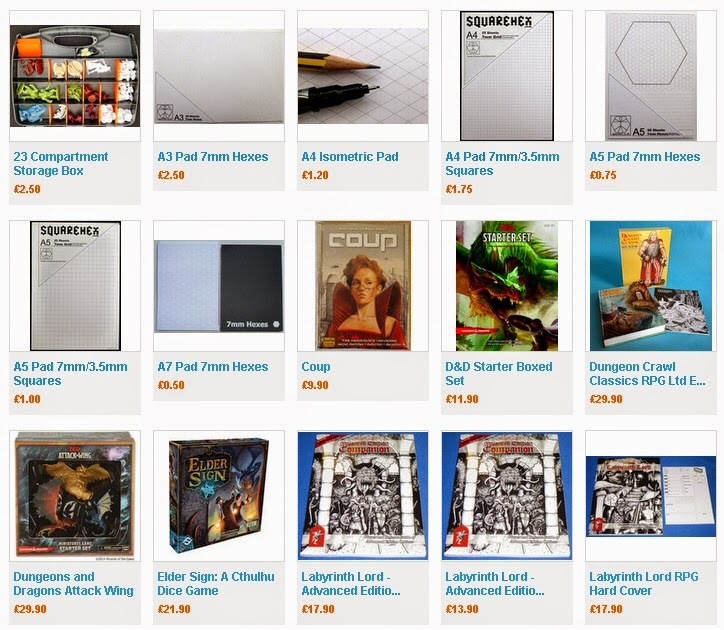 In it you will find savings on a selection of printed mapping pads along with a small range of games and books. Some of the items are limited stock so order early to avoid disappointment.